Aims: To explore the role of Fas in cardiomyocytic apoptosis induced by ischaemia through determining the histological relation between Fas expression and apoptosis in rat myocardium during ischaemia/infarction. Methods: The myocardial ischaemia model was produced by ligating the left coronary artery in Sprague-Dawley rats. The rats were killed from 10 minutes to seven days after surgery. Apoptotic myocardial cells were detected by the in situ terminal deoxynucleotidyl transferase mediated nick end labelling method, and the expression of Fas by immunohistochemistry and western blotting. Results: Cardiomyocytic apoptosis appeared from three to 36 hours after ischaemia. The expression of Fas could be detected by western blot from before surgery to seven days of ischaemia. Apoptosis and the expression of Fas in the cardiomyocytes appeared in different regions of the myocardium: apoptosis in the ischaemic region, Fas in the regions surrounding ischaemic myocardium. Conclusion: These results suggest that there is a tempero–spatial dissociation between the expression of Fas and apoptosis after coronary occlusion. Fas might not directly regulate the apoptosis of cardiomyocytes induced by ischaemia. Several studies of apoptosis in the heart have been performed in humans and animals.1–5 These studies have reported that cardiac myocytes undergo apoptosis in a wide variety of pathophysiological situations, including ischaemia,1,2,6,7 ischaemia/reperfusion,3,8 and haemodynamic overload and heart failure.9,10 In response to myocardial ischaemia, apoptosis often precedes necrosis.6 Inhibition of apoptosis by a variety of pharmacological and genetic approaches results in smaller infarctions.11–14 These findings highlight the importance of studying apoptosis in the heart, because it may provide valuable information for improving our understanding of this potential new target for cardioprotective treatment. Fas expression increases in the heart in response to ischaemia and other insults,6,15–19 but its role in cardiac myocyte apoptosis has been less clear. Interference with Fas signalling by means of neutralising anti-Fas ligand (FasL) antibodies, in addition to lpr mice (which lack Fas),20 results in decreased cardiac myocyte apoptosis in animal models of doxorubicin toxicity,19 and in isolated perfused hearts subjected to ischaemia/reperfusion.15 When subjected to 30 minutes of myocardial ischaemia and 72 hours of reperfusion, the size of the myocardial infarct is reduced by 42% in the FasL transgenic mice compared with their non-transgenic littermates.21 Moreover, recent studies have shown that Fas signalling is implicated in cardiac hypertrophy.22–25 These observations raise the possibility that Fas activation may not induce apoptosis in cardiac myocytes. In the classic Fas receptor pathway,26,27 it is generally accepted that the Fas gene upregulates the expression of Fas receptors in the cell membrane and that binding of FasL causes receptor activation, leading to the activation of caspases and subsequent apoptosis. According to classic Fas receptor theory, Fas should be expressed by the apoptotic cell before apoptosis can occur. We undertook our present study to explore the histological relation between the expression of Fas and the apoptosis of cardiomyocytes, and determine whether Fas mediates the pathway of apoptosis induced by ischaemia/infarction. We present evidence indicating that cardiomyocyte apoptosis and Fas expression appear in different regions of the myocardium—apoptosis in ischaemic regions, Fas in the regions surrounding ischaemic myocardium—and that cardiomyocytic apoptosis and Fas expression are not synchronised. These results suggest that the expression of Fas might not directly regulate cardiomyocytic apoptosis after coronary occlusion. Male Sprague-Dawley rats (220–300 g) were randomised to the ischaemic/infarcted group or the control group. In the ischaemic/infarcted group, the ischaemic/infarcted model of ligating the left anterior descending branch of the left coronary artery (LAD) was produced according to the method described by Selye et al.28 The heart was exposed through a left intercostal thoracotomy under sterile conditions, and the LAD was ligated using a silk suture. In the control group, sham operations (with thoracotomy and 7–0 silk put beneath the artery but without ligation) were performed. Animals were killed at 10 minutes; three, 4.5, six, 12, 24, and 36 hours; and seven days after coronary occlusion (each subgroup with five rats). The heart was quickly removed and washed in ice cold phosphate buffered saline. The left ventricle was cut into two halves along the long axis. One half was fixed in 10% buffered neutral formaldehyde solution overnight at 4°C, embedded in paraffin wax, and then sections were cut at 5 µm thickness. The other half was snap frozen in liquid nitrogen for the extraction of DNA and protein. Serial sections of the same sample were stained with haematoxylin and eosin (H&E), in situ terminal deoxynucleotidyl transferase mediated nick end labelling (TUNEL), and immunohistochemistry. After dewaxing, the tissue sections were stained by the TUNEL method.29 Apoptosis was visualised by means of 3′,3′-diaminobenzidine staining with H&E counterstaining. Negative control slides (in which the terminal deoxynucleotidyl transferase (TdT) enzyme was excluded) were processed at the same time. Positive controls were processed by incubating with a solution of 200 ng/ml DNAse I at 37°C for 15 minutes, before incubation with biolabelled 21-dUTP and TdT enzyme in TdT buffer. DNA was extracted from fresh frozen myocardial tissues according to the method described by Bialik et al.1 DNA samples (10 µg) were subjected to electrophoresis on a 2% agarose gel, stained with ethidium bromide, and photographed under ultraviolet illumination. We used immunohistochemistry to assess the presence of Fas, as described previously.30 A rabbit polyclonal antimouse/rat Fas primary antibody (1/60 dilution of antibody M-20; Santa Cruz Biotechnology, Santa Cruz, California, USA) was used, and the samples were incubated at 37°C for 90 minutes in a humidified chamber. A Zymed HistostainTM-SP kit (Zymed, South San Francisco, California, USA) was used for staining, according to the kit instructions. The colour was developed by means of 3′,3′-diaminobenzidine staining or 3-amino-9-ethylcarbazole. The slides were counterstained with haematoxylin. Negative control slides were processed at the same time with omission of the primary antibodies. Fas peptide (Fas-M20P; Santa Cruz) was used in another control slide. The sections were first stained with the TUNEL method. The colour was developed by means of the horseradish peroxidase substrate system, which produced a brown reaction product. After blocking of biotin with streptavidin, the sections were then processed for the immunostaining of Fas by means of the avidin–alkaline phosphatase substrate system, which produced a red product. Proteins were extracted from the fresh frozen left ventricular myocardium. Homogenised myocardial tissue was lysed in a solution containing 25 mmol/litre Tris/HCl (pH 7.2), 45 mmol/litre NaCl, 0.1% Nonidet P-40, and 0.02% EDTA with a protease inhibitor cocktail (100 µg/ml PMSF, 1 µg/ml aprotinin, and 1 µg/ml leupeptin). The protein concentration was evaluated against standard bovine serum albumin with a Bio-Rad assay reagent (Bio-Rad, Hercules, California, USA). Samples (100 μg) of each protein preparation were separated electrophoretically on a 10% sodium dodecyl sulfate polyacrylamide electrophoresis gel and transferred to a nitrocellulose membrane. The membrane was then incubated with anti-Fas (M-20) antibody (1/200 dilution; Santa Cruz) or anti-actin (I-19) antibody (1/100 dilution; Santa Cruz) overnight at 4°C. The membrane was washed three times for 30 minutes each with Tris buffered saline/Tween, then incubated with peroxidase conjugated goat antirabbit IgG (heavy plus light chain) (1/1000 dilution; Jackson ImmunoResearch Laboratories, West Grove, Pennsylvania, USA) for one hour at room temperature. Western blots were exposed on an x ray film with western blotting luminol reagent (sc-2048; Santa Cruz). To validate the reliability of the staining, two serial slides of the same sample, one for a positive control and another for a negative control, were used in each staining. Positive and negative controls for the TUNEL stain comprised treatment with DNase I and omission of TdT during the enzymatic reaction, respectively. In the first situation, the nuclei of cardiomyctes were stained brown (fig 1A), whereas in the negative controls no labelling was seen (fig 1C). Positive and negative controls for Fas immunostaining included the addition or omission of the primary antibody and co-incubation with the Fas peptide during the reaction. As shown by immunohistochemistry, Fas was localised primarily on the sarcolemma of cardiomyocytes (fig 1B). No staining could be detected when the primary antibody was omitted from the reaction (fig 1D). Furthermore, Fas staining was abolished by co-incubation with the Fas peptide used for immunisation (fig 1E), which demonstrated the specificity of positive staining for Fas. Parts (A and C) and (B, D, and E) are two sets of serial sections. (A, C) In situ terminal deoxynucleotidyl transferase (TdT) mediated nick end labelling with or without DNAse I and TdT enzyme and haematoxylin counterstain, of a sample 24 hours after ischaemia. (A) Positive control (brown); (C) negative control. (B, D) Immunostaining with or without anti-Fas antibody and haematoxylin counterstain, of a sample seven days after ischaemia. (B) Cardiomyocytes with positive staining for Fas (brown); (D) negative control for Fas staining. (E) Co-incubation with the anti-Fas antibody and the Fas peptide abolished Fas immunoreactivity. To show both the relation between the expression of Fas and apoptosis, and between Fas and ischaemia, serial sections of the same sample were stained by H&E, immunstaining for Fas, and the TUNEL method (figs 2 and 3). In the ischaemic/infarcted groups, from three hours of LAD ligation onwards, ischaemic myocardium could be detected by H&E staining. There was no clear eosinophilic region (ischaemic region) 10 minutes after ligation (fig 2A), but obvious eosinophilic regions could be found in the free wall and septal wall of the left ventricle from three to 36 hours after ligation (figs 2B, 3C). Collagen tissue without cells, instead of the eosinophilic region, could be detected by means of H&E staining in the samples from seven days after ligation (fig 2C). Both apoptosis and Fas expression could be induced by ischaemia in the myocardium; however, apoptosis and Fas expression were found in different regions of the myocardial tissue. Apoptotic cardiomyocytes could only be found in the ischaemic region of the myocardium, whereas no apoptotic cardiomyocytes could be detected in non-ischaemic myocardium (fig 2D–F, 3A). 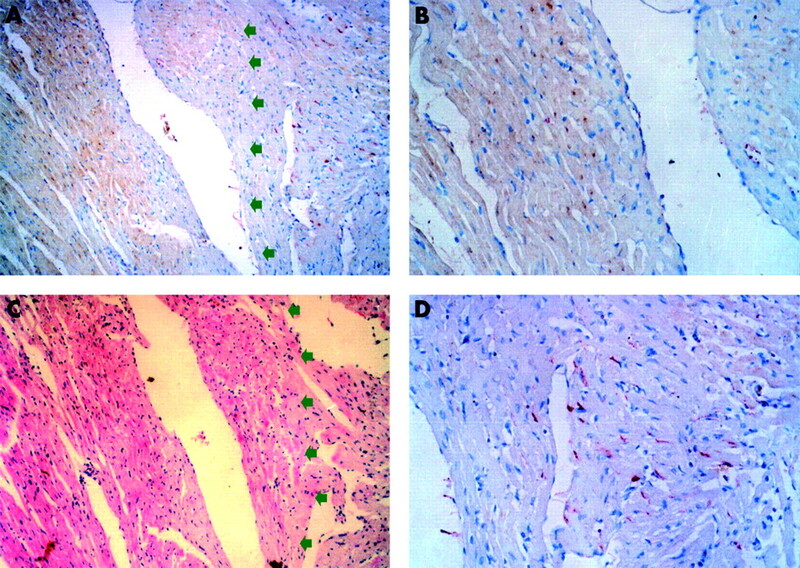 Positive staining for Fas was mainly seen in the regions surrounding ischaemic myocardium without apoptosis, not in ischaemic myocardium (fig 2G, 2H, 3A). In the control (data not shown) and 10 minutes of ligation groups, apoptosis and Fas expression could not be detected. These results indicate that there was a spatial dissociation between the expression of Fas and apoptosis. Serial sections from three different ischaemic time points: (A, D, G), 10 minutes; (B, E, H), 24 hours; and (C, F, I), seven days. (A–C) Haematoxylin and eosin staining; (D–F) in situ terminal deoxynucleotidyl transferase mediated nick end labelling staining; (G–I) immunostaining for Fas. (A, D, G) These serial sections show no eosinophilic regions, no apoptotic cardiomyocytes, and no expression of Fas seen in the 10 minute ischaemia samples, respectively. (B, E, H) These serial sections show that the ischaemic region is in the left half of the field, normal myocardium in the right half, and that cardiomyocytic apoptosis and Fas expression are found in different regions of the myocardium: apoptosis (brown) in the ischaemic region and Fas expression (red) in the regions surrounding the ischaemic myocardium. (C, F, I) These serial sections show that necrotic cardiomyocytes were absorbed and replaced by scar tissue. Fas (brown) was expressed in the perinecrotic region, and apoptotic cardiomyocytes were not detected in the sample after seven days of ligation. Arrows point to positive cells. Double staining (immunostaining for Fas and in situ terminal deoxynucleotidyl transferase mediated nick end labelling (TUNEL)) shows that Fas and TUNEL positivity were located in non-ischaemic myocardium without apoptosis and ischaemic myocardium, respectively. (A, C) Serial sections from a sample after 36 hours of ischaemia. (A) Double staining (red for Fas, brown for TUNEL). Note that Fas positive cells and TUNEL positive cells are distinct populations. Arrows point to the ischaemic region. (B) Magnification of a region positive by TUNEL. (D) Magnification of a region positive for Fas immunostaining. (C) Haematoxylin and eosin stain. 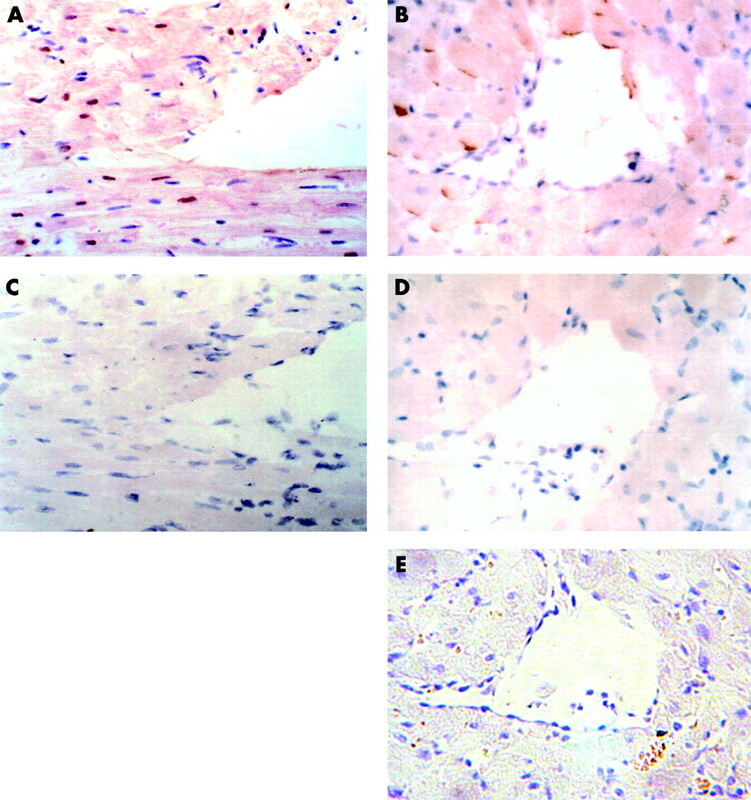 The results of double staining (immunostaining for Fas and TUNEL) also showed that Fas was expressed in non-ischaemic myocardium without apoptosis (fig 3). In the ischaemic/infarcted group, apoptosis occurred from three to 36 hours after LAD ligation. The expression of Fas also began at three hours, but continued for seven days after ligation, as assessed by immunohistochemistry. To verify these results, DNA gel electrophoresis and western blot analysis were performed. 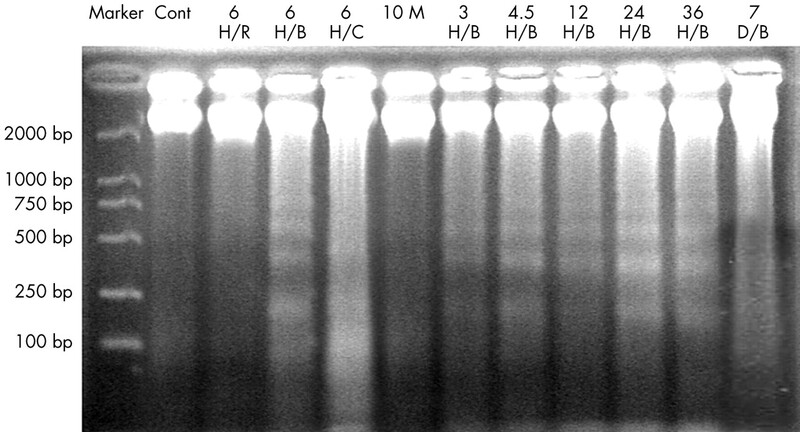 DNA was isolated from the border zones of ischaemia in the three to 36 hours of ligation groups, and gel electrophoresis showed patterns of DNA laddering (fig 4). The DNA isolated from the central areas of ischaemia showed less specific degradation (smears). DNA isolated from the border zones of ischaemia in the seven days of ligation group did not show the laddering pattern. Western blot analysis confirmed that Fas was increasingly expressed in the ischaemic samples from three hours to seven days. Western blotting detected only a small amount of Fas expression in the control and 10 minutes of ischaemia samples (fig 5). Gel electrophoresis shows a ladder pattern, characteristic of apoptosis. The DNA isolated from the control (lane Cont), 10 minute ischaemic/infarcted sample (lane 10 M), and a region remote from ischaemia in the three to 36 hour ischaemic/infarcted sample (lane 6 H/R) does not show the ladder pattern. DNA isolated from the border zones of ischaemia (lanes 6 H/B, 3 H/B, 4.5 H/B, 12 H/B, 24 H/B, and 36 H/B represent the six, three, 4.5, 12, 24, and 36 hour ischaemic/infarcted groups, respectively) shows the ladder pattern. DNA isolated from the central areas of ischaemia (lane 6 H/C) shows less specific degradation (a smear). DNA isolated from the border zones in the seven day ischaemic/infarcted group shows no ladder pattern (lane 7 D/B). DNA in lanes 6 H/R, 6 H/B, and 6H/C is isolated from the region remote to ischaemia, border zones, and central areas of a six hour ischaemic/infarcted sample, respectively. Western blotting for Fas. Only a small amount of Fas can be detected in the control sample. Increasing amounts of Fas are expressed in the ischaemia samples from 10 minutes to seven days. Actin was used as a loading control. Except for the control, all samples of tissue were from the boundary area and included half normal and half ischaemic tissue. One representative example of five experiments is shown. It has been reported that apoptosis and Fas expression can be induced in cardiomyocytes in response to hypoxia in vitro,16 ischaemia in vivo,2,6 and mechanical stretch.31 All these studies showed that upregulation of Fas expression was accompanied by cardiomyocyte apoptosis. However, in these studies, Fas expression was detected by northern blotting, western blotting, or immunohistochemistry. The results could not show the histological relation between cardiomyocyte apoptosis, the expression of Fas, and myocardial ischaemia, or show the relation between apoptosis and the expression of Fas at several time points after LAD ligation. In a study of the effects of Fas on cardiomyocyte apoptosis, Jeremias and colleagues15 found that hypoxia and reoxygenation caused a pronounced increase in sensitivity to the apoptotic effects of FasL in primary cultures of adult rat myocytes. Hearts isolated from mice lacking functional Fas showed an appreciable reduction in cell death after ischaemia and reperfusion compared with wild-type controls. Therefore, it was concluded that Fas was directly involved in cell death after myocardial ischaemia. However, in that study, the expression of Fas was not detected, especially by immunohistochemical methods, and a histological association between Fas and apoptosis could not be demonstrated. Our present study investigated the histological relation between cardiomyocyte apoptosis and the expression of Fas in serial sections of the same sample, using TUNEL and immunohistochemistry at different time points after the induction of ischaemia (from 10 minutes to seven days); DNA ladders and western blots were used to validate the TUNEL and immunohistochemistry results. It was shown that ischaemia not only resulted in cardiomyocyte apoptosis, but also induced the expression of Fas. Cardiomyocyte apoptosis could be detected by the TUNEL method from three to 36 hours after LAD ligation, but not at seven days. Fas expression could be detected by immunohistochemistry from three hours to seven days after ligation, and by western blots from before ligation to seven days after ligation, although in the control and 10 minute ischaemic/infarcted groups, the expression of Fas was too low to be detected by immunohistochemistry. Importantly, we found a tempero–spatial dissociation between the expression of Fas and apoptosis, which appear in different regions of the myocardium: apoptosis in ischaemic regions and Fas in the regions surrounding the ischaemic myocardium. Cardiomyocyte apoptosis and Fas expression are not synchronised. Whereas cardiomyocyte apoptosis cannot be detected by seven days after LAD occlusion, the expression of Fas is still upregulated. Does Fas regulate the apoptosis of cardiomyocytes induced by ischaemia? It is hard to give an affirmative reply from the results of our study. According to the classic pathway of Fas regulating apoptosis, Fas should be expressed at the membrane of apoptotic cells. However, in our study Fas was expressed by non-apoptotic cells, which cannot be explained by the classic theory of Fas signalling. Our results indicate that cardiomyocytic apoptosis might not be directly related to the expression of Fas during ischaemia. Upregulation of Fas might be a phenomenon in myocardial ischaemia, but Fas might not regulate the cardiomyocyte apoptosis induced by ischaemia. So, what is the implication of upregulation of Fas? The expression of Fas might be responsible for hypertrophy of non-ischaemic myocardium. A recent study has shown that Fas receptor signalling could induce cardiac hypertrophy following pressure overload,22 and that FasL might exert potent anti-inflammatory actions in the setting of myocardial ischaemia/reperfusion injury.21 If Fas is indeed involved in apoptosis in this setting, the mode by which the Fas receptor regulates cardiomyocyte apoptosis induced by ischaemia might be different from the classic theory of apoptosis signalling by Fas. In conclusion, we found a tempero–spatial dissociation between the expression of Fas and apoptosis during myocardial ischaemia. Fas might not play an important role in cardiac apoptosis induced by ischaemia—the expression of Fas might not directly relate to cardiomyocytic apoptosis during myocardial ischaemia. The importance of the expression of Fas during myocardial ischaemia and the pathway of apoptosis induced by ischaemia will require more detailed studies. We thank Dr N Yamanaka for reviewing the manuscript, and Dr X Chen for providing the working environment. Bialik S, Geenen DL, Sasson IE, et al. Myocyte apoptosis during acute myocardial infarction in the mouse localizes to hypoxic regions but occurs independently of p53. J Clin Invest 1997;100:1363–72. Cheng W, Kajstura J, Nitahara JA, et al. Programmed myocyte cell death affects the viable myocardium after infarction in rats. Exp Cell Res 1996;226:316–27. Fliss H, Gattinger D. Apoptosis in ischemic and reperfused rat myocardium. Circ Res1996;79:949–56. Narula J, Haider N, Virmani R, et al. Apoptosis in myocytes in end-stage heart failure. N Engl J Med 1996;335:1182–9. Olivetti G, Quaini F, Sala R, et al. Acute myocardial infarction in humans is associated with activation of programmed myocyte cell death in the surviving portion of the heart. J Mol Cell Cardiol 1996;28:2005–16. Kajstura J, Cheng W, Reiss K, et al. Apoptotic and necrotic myocyte cell deaths are independent contributing variables of infarct size in rats. Lab Invest 1996;74:86–107. Saraste A, Pulkki K, Kallajoki M, et al. Apoptosis in human acute myocardial infarction. Circulation 1997;95:320–3. Gottlieb RA, Burleson KO, Kloner RA, et al. Reperfusion injury induces apoptosis in rabbit cardiomyocytes. J Clin Invest 1994;94:1621–8. Olivetti G, Abbi R, Quaini F, et al. Apoptosis in the failing human heart. N Engl J Med 1997;336:1131–41. Teiger E, Than VD, Richard L, et al. Apoptosis in pressure overload-induced heart hypertrophy in the rat. J Clin Invest 1996;97:2891–7. Chen Z, Chua CC, Ho YS, et al. Overexpression of Bcl-2 attenuates apoptosis and protects against myocardial I/R injury in transgenic mice. Am J Physiol Heart Circ Physiol 2001;280:H2313–20. Yaoita H, Ogawa K, Maehara K, et al. 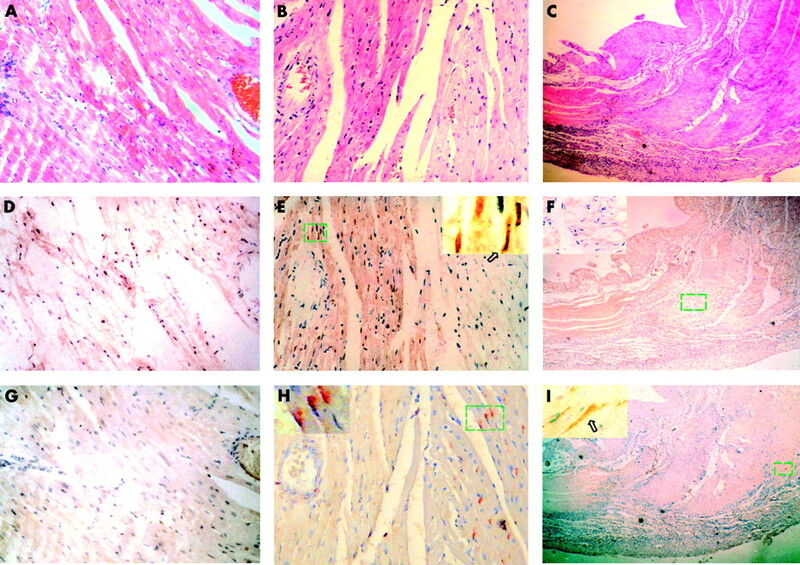 Attenuation of ischemia/reperfusion injury in rats by a caspase inhibitor. Circulation 1998;97:276–81. Holly TA, Drincic A, Byun Y, et al. Caspase inhibition reduces myocyte cell death induced by myocardial ischemia and reperfusion in vivo. J Mol Cell Cardiol 1999;31:1709–15. Brocheriou V, Hagege AA, Oubenaissa A, et al. Cardiac functional improvement by a human Bcl-2 transgene in a mouse model of ischemia/reperfusion injury. J Gene Med 2000;2:326–33. Jeremias I, Kupatt C, Martin-Villalba A, et al. Involvement of CD95/Apo1/Fas in cell death after myocardial ischemia. Circulation 2000;102:915–20. Tanaka M, Ito H, Adachi S, et al. Hypoxia induces apoptosis with enhanced expression of Fas antigen messenger RNA in cultured neonatal rat cardiomyocytes. Circ Res 1994;75:426–33. Wollert KC, Heineke J, Westermann J, et al. The cardiac Fas (APO-1/CD95) receptor/Fas ligand system: relation to diastolic wall stress in volume-overload hypertrophy in vivo and activation of the transcription factor AP-1 in cardiac myocytes. Circulation 2000;101:1172–8. Yue TL, Ma XL, Wang X, et al. Possible involvement of stress-activated protein kinase signaling pathway and Fas receptor expression in prevention of ischemia/reperfusion-induced cardiomyocyte apoptosis by carvedilol. Circ Res 1998;82:166–74. Nakamura T, Ueda Y, Juan Y, et al. Fas-mediated apoptosis in adriamycin-induced cardiomyopathy in rats: in vivo study. Circulation 2000;102:572–8. Nagata S, Suda T. Fas and Fas ligand: lpr and gld mutations. Immunol Today1995;16:39–43. Yang J, Jones SP, Suhara T, et al. Endothelial cell overexpression of fas ligand attenuates ischemia-reperfusion injury in the heart. J Biol Chem 2003;278:15185–91. Badorff C, Ruetten H, Mueller S, et al. Fas receptor signaling inhibits glycogen synthase kinase 3 beta and induces cardiac hypertrophy following pressure overload. J Clin Invest 2002;109:373–81. Nelson DP, Setser E, Hall DG, et al. Proinflammatory consequences of transgenic fas ligand expression in the heart. J Clin Invest 2000;105:1199–208. Budd RC. Death receptors couple to both cell proliferation and apoptosis. J Clin Invest2002;109:437–41. Wajant H. The Fas signaling pathway: more than a paradigm. Science2002;296:1635–6. Nagata S, Golstein P. The Fas death factor. Science1995;267:1449–56. Ashkenazi A, Dixit VM. Death receptors: signaling and modulation. Science1998;281:1305–8. Selye H, Bajusz E, Grasso S, et al. Simple techniques for the surgical occlusion of coronary vessels in the rat. Angiology 1960;11:389–407. Gavrieli Y, Sherman Y, Ben-Sasson SA. Identification of programmed cell death in situ via specific labeling of nuclear DNA fragmentation. J Cell Biol1992;119:493–501. Krajewski S, Krajewska M, Shabaik A, et al. Immunohistochemical determination of in vivo distribution of Bax, a dominant inhibitor of Bcl-2. Am J Pathol 1994;145:1323–36. Leri A, Claudio PP, Li Q, et al. Stretch-mediated release of angiotensin II induces myocyte apoptosis by activating p53 that enhances the local rennin–angiotensin system and decreases the Bcl-2-to-Bax protein ratio in the cell. J Clin Invest 1998;101:1326–42.